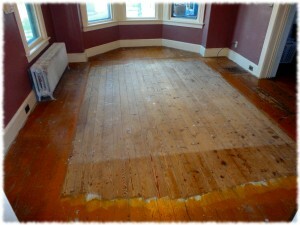 The floors before refinishing. Yuck! 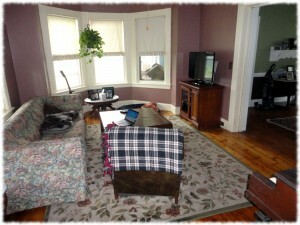 Susanna and I repaired and repainted the living room walls and ceiling in late 2011. At that time we decided to not do the floors and only finish the project we started. The floors had been bothering Susanna since then. This summer we discussed hiring someone to refinish the floors, but decided to take a weekend to try the project ourselves. We picked last weekend to try to finish the project. We emptied out the room before Friday. 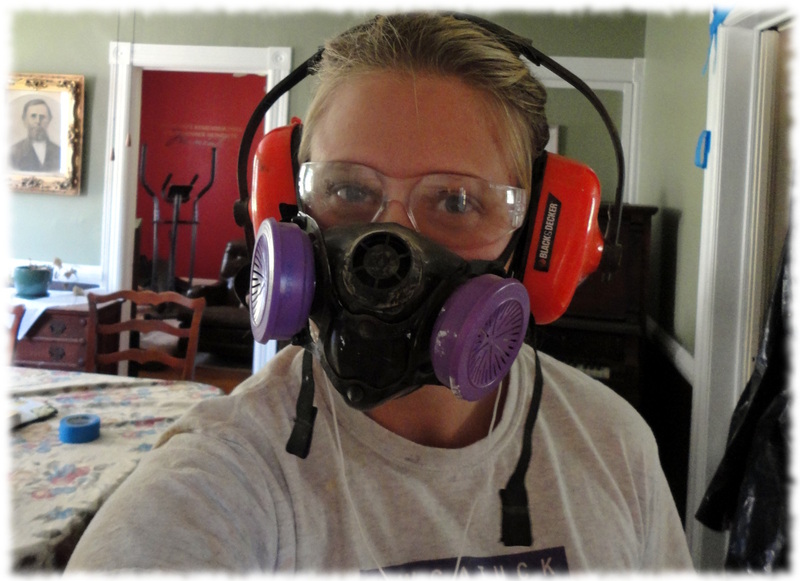 I rented the floor sander for Friday and Saturday and started sanding on Friday night. The paint on the floors was more difficult to get off than I had anticipated (and went through more sandpaper than I had planned). 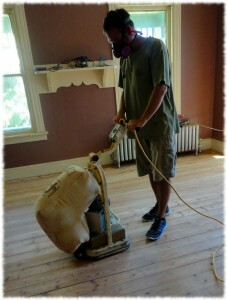 Finally we had the floors sanded and ready for the first coat on Saturday night. I put down a coat of sanding sealer (shellac), and a couple of hours later the first coat of Minwax rapid dry floor polyurethane. On Sunday morning I did a second coat of poly before picking up the boys. By Sunday night I could tell that too much dust had settled in the top coat, and it needed to be sanded smooth and a third coat put on the floor. However, the floors weren’t dry enough to sand on Sunday night, so Susanna and the boys hand sanded the dust out of the top coat on Monday. I applied the top coat on the floor Monday night after the boys went to bed. 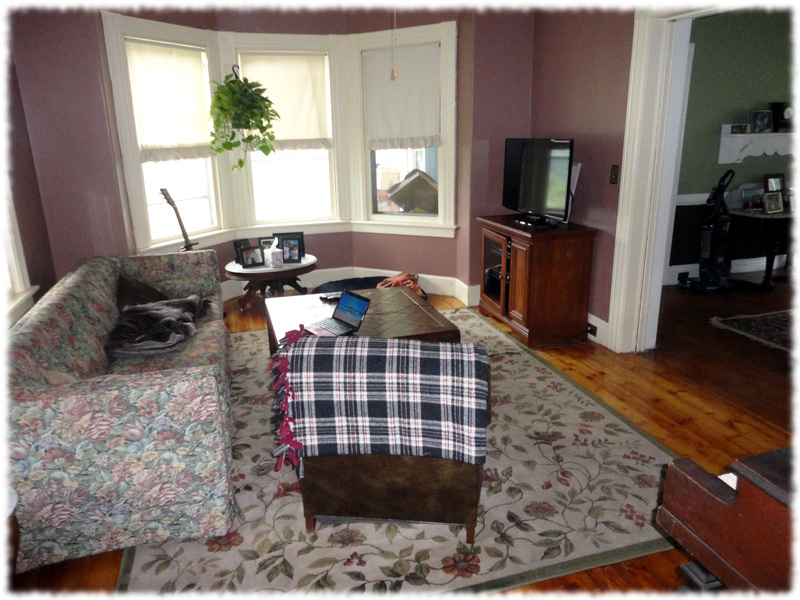 We let the floors sit until this weekend and then moved the furniture back into the room yesterday. In hindsight we should have waited longer before moving the piano. The weight of the piano left some marks in the new finish – our plan is to sand out those parts and put down more poly to cover up those parts. I don’t see a problem fixing the mistakes. However, we are waiting for the humidity to drop before putting more poly down. The nearly finished living room (it is still waiting for some pictures to be hung). Susanna getting ready to sand the floors.